I love coincidences—especially those involving people moving in and out of our lives—so imagine my delight when Tim Cage, my Living Proof co-author, texted me this photo taken after a coaching session he conducted for the American Lung Association’s MyShot campaign. The photo is of Tim and Dallas resident Jane Elterman, one of the advocates featured in the campaign, which highlights the stories of individuals’ firsthand experiences with the flu in order to encourage people 50+ to get their annual flu shot. In 1998, after Jane’s husband died of an extremely rare sarcoma, she couldn’t help feeling that there may have been treatment options they hadn’t explored. So 10 years later, when she was diagnosed with stage IV lung cancer, she didn’t stop searching until she found a treatment plan that matched her strong will to live. Fast-forward another 10 years to 2018. Jane still hasn’t let her cancer diagnosis stop her from living a full life that includes teaching elementary school and traveling with her new husband. But along the way, there was one year Jane skipped getting her annual flu shot and a case of the flu brought her life to a screeching halt for the better part of a month—a painful reminder of just how important the vaccine is for those with compromised immune systems. That’s the story Jane had been working with Tim to hone during their coaching session. Turns out, Jane and I go way back—not only to kindergarten, but all the way to birth. We were born a day apart to mothers who shared the same northeastern Ohio hospital room. Then we were classmates all the way through high school. The last time we saw each other, we were most likely wearing our graduation gowns. Though we’d long gone our separate ways, I knew via friends that Jane was a lung cancer survivor. But what I didn’t know was what a vocal advocate she’d become, sharing her experiences not only on behalf of the MyShot campaign, but also for the American Lung Association’s LUNG FORCE initiative as a LUNG FORCE Hero, as well as for the Cancer Treatment Centers of America (CTCA)—where she found successful treatment and later became part of Cancer Fighters, a CTCA program that links cancer survivors to those recently diagnosed with the disease. Since learning of our common passion for personal stories and advocacy, Jane and I have reconnected. She’s told me that some of her most rewarding work is via the Cancer Fighters program. 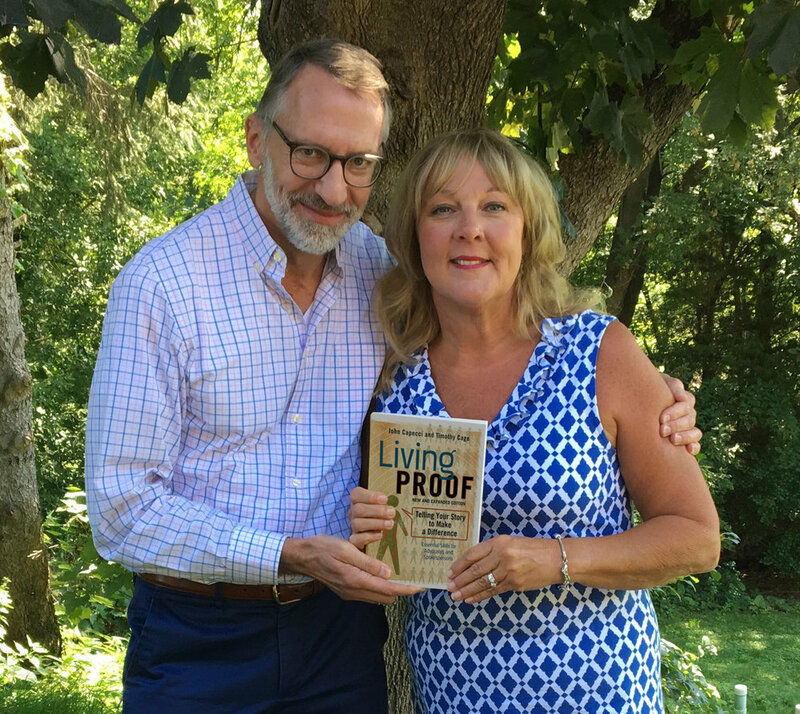 I’m so glad to have reconnected with Jane, and I love the fact that Living Proof and our shared passion for the power of personal stories (and coincidences!) brought us back together nearly six decades after we were first introduced to one another in an Ohio hospital room. Do you have a story of a coincidence that led to a happy reunion? Or a story about how you’re using your experiences to advocate for a cause you care about it? If so, Tim and I would love to hear it. Email us at info@livingproofadvocacy.com.